How important is a likeness in a work of art? Maybe not as important as it seems; elsewhere on this site we’ve looked at how potentially disastrous it would be to use Hiroshige’s 53 Stations of the Tokaido Road as a route map; and so it was for centuries that depictions of actors or warriors could not be said to be accurate likenesses – or indeed any kind of likeness at all to the subjects they are depicting. All of this was to do with conventions; the traditions of Chinese and Japanese painting, the relative importance of actors and their roles, the shifting emphasis toward celebrity and the sophistication of the woodblock medium. Kabuki is highly stylised, the performance relies on the tension between restraint (within very closely confined convention), and the controlled expression of extreme emotion – almost all kabuki theatre is after all melodrama. Principally because of censorship, a conspiracy exists between the audience and the performer – within this limited repertoire existed the potential for the greatest expression of art and emotion. This relationship extended to the woodblock artist and print-buying public. Conventions of display, pose, space, expression and costume were strict – as on the stage – and an artist’s value was dependent upon how he performed within these strict conventions. Oddly, likeness was not considered important until the end of the eighteenth century when the artist Shunso introduced it; from then on ‘true likeness’ became increasingly important. 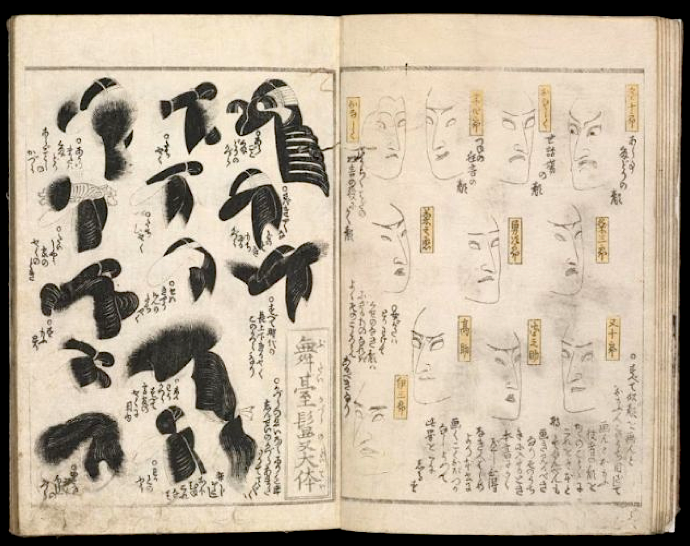 The artist Toyokuni I expanded the reach of Nigao (true likeness) in 1817 and even wrote an instruction manual about how to achieve it titled, Quick Instruction in the Drawing of Actor Likenesses (pictured above). 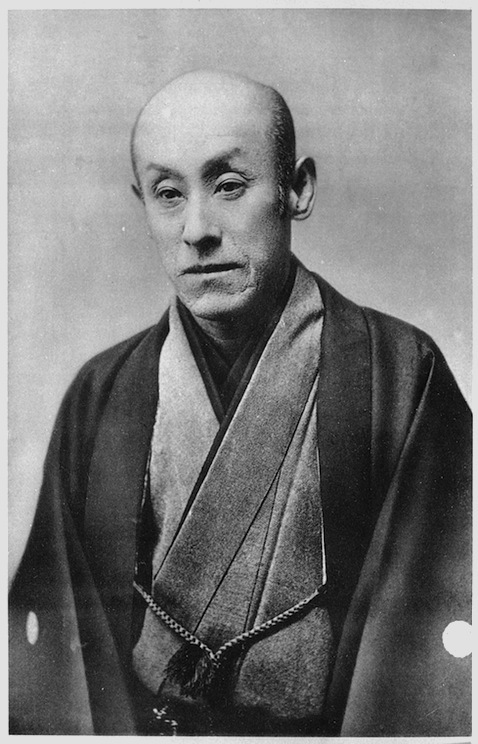 This was a sophisticated code that conveyed the features of individual actors without breaking the convention of the kabuki face with its heavy make up and stylised expression. He stresses the importance of the nose, the eye, the mouth and the eyebrow. Portraits were almost always shown in three-quarter view rather than in profile or straight on, the artist was to draw the nose first, then the mouth, the brows, the eyes and finally the outline of the face itself. It would be easy to dismiss this approach as mere caricature (which it can be when carried out by unskilled draughtsmen) but for Toyokuni and artists such as Kunisada there is something else going on, more complex and considered. Within these constraints, these great ukiyo artists were able to show great expression and meaning; they conveyed exquisite subtlety of emotion – longing, anger and jealousy – assisted by subtle modulations of colour and discreet embossing to the facial features. Kunisada achieved a complete ascendance of actor over character in his later portraits, necessary when it was forbidden to name actors on ukiyo prints. This push-pull, this duality between actor and role is what gives these great portraits their attraction. The role could be identified by pose, by clothing, by signifiers… an oar, a particular type of hat or stage prop. The actor by contrast was portrayed by features and by touch, and this is where Nigao is of the greatest importance. The pictures on this page are of the actor Ichimura Uzaemon XIII. 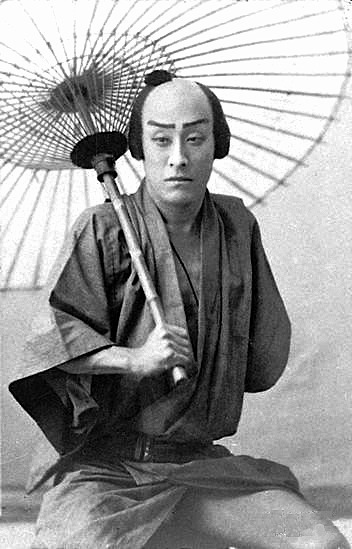 Alongside Ichikawa Danjuro IX, he was the greatest kabuki actor of the nineteenth century. His exceptionally long career meant that he was pictured countless times between 1859 and 1894 by the most prominent artists of the century. Like so many kabuki actors he was known by many different names, the most famous being Baiko, (Onoe Baiko) and Onoe Kikugoro V. Despite the very varied roles that he played – unusually, both male heroes (tachiyaku) and onnagata (female roles) – we can see how artists such as Kunisada and Kunichika (illustrated) kept a recognizable consistency with his features despite the need to exaggerate his image for the sake of the role or the excessive make up that the part (or his advanced age) required. We are fortunate to also have a photograph of Kikugoro from the middle of his long career. The wonderful early portrait by Kunisada shows Uzaemon at the age of eighteen playing astreet tough, (the tattoo sleeve is a painted silk sheath that the actor would slide over his arm). Contrast that with the late portrait of the onnagata role (female) with inset birds and the facial features are all instantly recognizable – the thin downturned mouth, the blocky, slightly elongated head and the prominent chin. Compare these two images with the two photographs of the actor and whilst the likeness is good, the artists have exaggerated certain characteristics to create an image… a persona if you like, that stands in for the actor in print. Remarkably, these beautiful portraits have achieved a perfect balance of two tricky things – creating a likeness and projecting a character in role, something that in its subtlety far exceeds the demands of mere caricature – or portraiture for that matter. 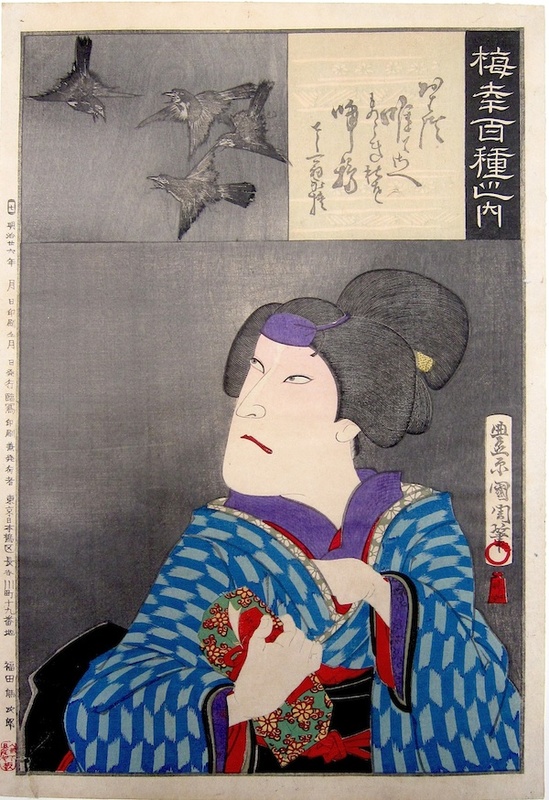 Kunisada: The Later Actor Portraits runs at the Toshidama Gallery until 2nd March, 2012. This entry was posted in Floating World, Japanese Art, Japanese Art Gallery, Japanese prints, japanese woodblock prints, kabuki theatre, Kunichika, Kunisada, Tattoo Art, Toshidama Gallery., ukiyo-e art and tagged floating world, Ichimura Uzaemon XIII, Japanese prints, Japanese Woodblock Prints, Kabuki, Kunisada, Onnagata, Onoe Baiko, Onoe Kikugoro V, Toshidama Gallery, Toyohara Kunichika, Toyokuni III, Ukiyo-e. Bookmark the permalink.